Melbourne Cup tips Free horse racing tips for Australian TAB meetings on November 6. Racing and Sports highlight our standout plays at Australian TAB meetings for November 6. YUCATAN could hardly have been more impressive at his Australian debut, taking control of the Herbert Power a long way out and putting a space on his rivals before being shut down late. Hard to know how much more there was in the tank there but he looked fantastic, the time was strong, and the form has already worked out. He's top pick. MAGIC CIRCLE has been dominant in two runs since joining this stable. Stays well and has a powerful finishing burst. Set for this and looming as a key threat. CROSS COUNTER has a similar profile as last year's winner Rekindling. Smart form and runs for a top trainer and jockey. Best roughie might be Finche. Beaten at Geelong but lightly raced and no shock to see him improve sharply now. SELECTIONS: Backing #11 Yucatan. Multiples around 11, 3, 23, 13. Shadow Bridge and Better Take Cover look the pacesetters. NOVEMBER MAN is well suited back to this CL1. Effort two back on the Kensington track when narrowly beaten is top form. Sting out of the ground took from his finishing sprint most recently therefore happy to forgive.. Better suited here and remotely near best he should be winning this. SHADOW BRIDGE showed exceptional speed to win at Newcastle last start. Will look the winner again here but whether he is seasoned enough to hold his winning form remains to be seen. BETTER TAKE COVER for Markwell was solid enough last time in. Has claims. SELECTIONS: #1 November Man for the win. Oxford Poet and Noble Joey the likely lead pair from inside barriers. ISAURIAN was a dual acceptor. Was scratched from Rosehill on Saturday to instead contest this where he profiles as an excellent chance. Both runs so far this prep have been full of merit. Still yet to reach the level he hit last prep when running second at stakes level. TACTICAL ADVANTAGE drops back in grade after a forth behind Pierata in the Sydney Stakes. Looks well placed at this level. MARSUPIAL got his campaign back on track when third at this course and distance behind Noble Joey last start. Will be fitter again and has won third up in the past. TANGO RAIN has been freshened since struggling first up. Has been kept ticking over with a trial win at Warwick Farm. OXFORD POET an honest customer worth thought from barrier 1. SELECTIONS: Going with #7 Isaurian from #1, #5 and #8. SINGLE HANDED is a progressive gelding who dug deep to win his maiden at Echuca last start. Rated well there and should only get better with further racing. Can go on with it. CHAPAL made some ground when resuming. Was racing well before the break and is suited up in trip. Fitter second up and expecting better. UNSCOPEABLE has claims off a Gawler win two starts back. GO STRAIGHTANDHARD is an exotic chance. SELECTIONS: #2 Single Handed won last start and can go on with it. Backing straight out. FIONNLAGH is a lightly-raced horse on the up. Fought hard to miss narrowly last start after winning his previous two. Gate one suits his style of racing and he looks capable of going through his grades. STELLARCRAFT is honest having placed at his last three starts since scoring an Ipswich win. Only has to hold his form to be in the finish again. BRAT ATTACK made a good return when runner up at Gold Coast and can progress second up. TAKES TIME won at Sunshine Coast before charging home last time. Contender. SELECTIONS: Backing the progressive #6 Fionnlagh straight out. Race Synopsis: Cross Counter capped a great year for Godolphin and trainer Charlie Appleby in taking out Australia's most famous race after the trainer won the Derby (Gr 1, 1m4f) at Epsom in June. 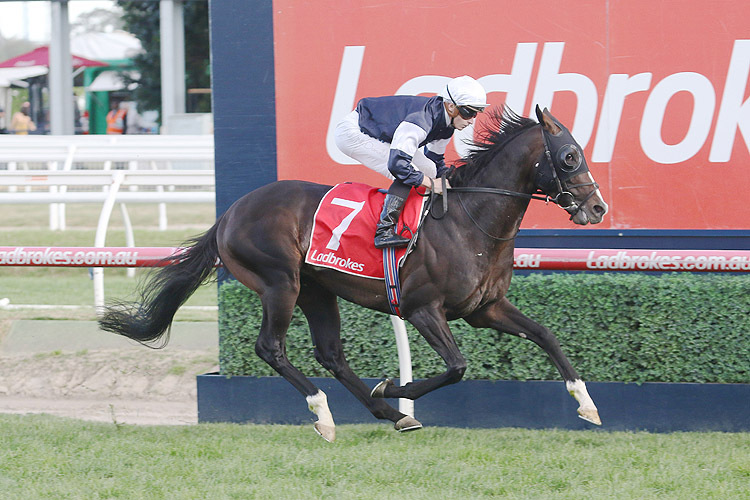 Ridden patiently by Kerrin McEvoy, the Northern Hemisphere three-year-old settled a distant 22nd and was still well back before commencing his move nearing the 600m. He switched deep on straightening, was 12th at the 400m and then finished strongly under his light weight (51kg) to well in an impressive staying performance. Marmelo raced well back in 20th place before improving between runners coming to the home turn. He switched to the inner on straightening, got through to take the lead at the 200m, only to be caught over the closing stages for a gallant second. A Prince Of Arran had a good trip in eighth place, went to sixth at the 800m, improved between runners coming to the home turn, looked dangerous when he challenged strongly at the 300m and then battled well for a very good third. Finche went forward from his wide barrier (15), raced outside the leader (Runaway), went to the front at the home turn and then fought on very well for (3.5 lengths) fourth after running a bold race. Rostropovich began well but was caught wide from his difficult barrier (21) racing in sixth place. He was under pressure coming to the home turn but he kept battling on really well for (4.5 lengths) fifth, his wide barrier proving costly. The sole female in the race, Youngstar raced in tenth place, went deep and into clear running on straightening and then fought well for (5.8 lengths) sixth in a very honest performance. Of the others: Best Solution was slowly away, settled near the tail of the field, got along the inner in the straight to finish (8.8 lengths) eighth, Muntahaa was back in 15th place but did not really threaten, finishing (9.6 lengths) ninth, as too Yucatan who was 12th in the mid-staged before finishing (12 lengths) 11th, Magic Circle was handily place but tired for (20 lengths) 16th while Avilius (22nd) lost all chance being badly checked in the early stages when The Cliffsofmoher broke down.